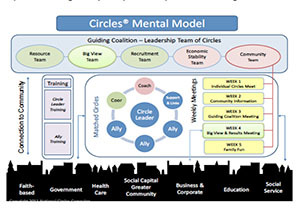 The Circles Campaign is set to start up on January 9th, 2013 in Akron – bringing this endeavor to Summit County for the first time. Those of middle class or wealth that would like to be of support, not financially, but through relationship and positive reinforcement, are encouraged to become a part of this initiative. Those in poverty who have graduated “Getting Ahead” are also encouraged to join, as it is the next step in their journey towards financial freedom. The Circles Campaign is all about putting action behind the plan that those in poverty created during their Getting Ahead classes. Allies of wealth or middle class will be there to help guide them along the way. 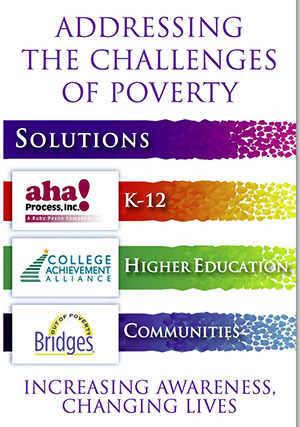 This campaign is currently in about 7 other communities in Ohio and 77 communities throughout the U.S.
Others in the community have been involved in the overall “Bridges out of Poverty” efforts, including OPEN M and the Harvest Home. Though it may seem to be just popping up out of nowhere, there’s been much work and effort behind this initiative for years. “Circles has been in the works for 3 years now. (We’ve been) talking about how we really need this – we need the next step for the Getting Ahead graduates. 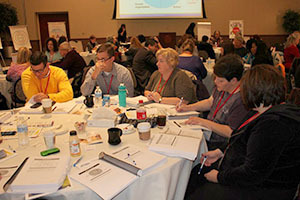 We’ve never had a Circles here in Summit County, so this is going to be the first group of Circle leaders and allies starting in January,” Megan Scheck, MSSA, LSW, Circles Administrator at Akron Summit Community Action, Inc. said. 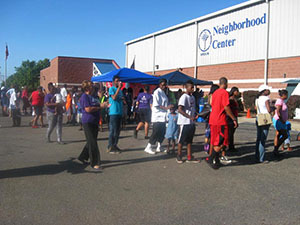 Akron Summit Community Action is a member agency and partner providing programming for Circles. 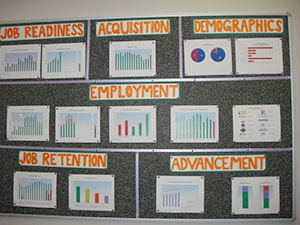 As of December 2012, they were wrapping up their recruitment stage. “We’re getting volunteers to be allies and people more involved in our guiding coalition. We’re putting all of the pieces in place so that we can start building relationships in January,” Scheck said. Yaminah Martin has struggled with poverty all of her life. She is a graduate of Getting Ahead – a 15 week course, making her a potential Circle leader. “It’s meant for people living in poverty to pretty much be aware of their situation. It gives details of the different economic classes, stereotypes and why people in poverty are in poverty,” Martin explained. “I grew up in generational poverty through and through. I’ve seen drugs and alcohol in my family. We didn’t know the next time someone was going to be fed, we don’t know if the lights or water were going to be on,” she said of her conditions growing up. 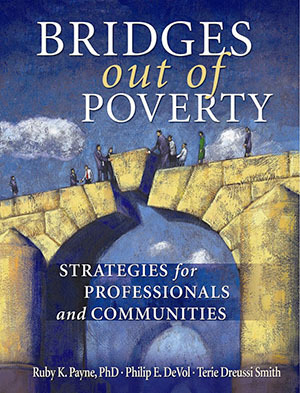 Oftentimes those in poverty consider it the norm because they know no different. “I didn’t really know I was in poverty because everyone lives the same way from the neighborhood,” Martin shared. She says that it wasn’t until she was 13 years old that she realized she was living in poverty. “At 13 I kinda had a moment where I saw that this is not the way people are supposed to live,” she said. Martin graduated high school and got a scholarship, but still struggled with a poverty mindset that dictated her life. “I did everything I was supposed to do but because of those barriers at home and with your family… I had a child at an early age, I was back and forth from Columbus to Akron all the time due to family issues and eventually I had to drop out of Ohio State,” she said. “Even though you’re getting these things pulling you up and you’re trying to go forward you still have those barriers that keep you down. I can go forward but still need child care, I can go forward but still need a roof over my head,” Martin said. Life for her while trying to get ahead isn’t easy. “I had odd jobs working full time, part time and going to school full time – all while still being a mother. I pretty much came to the point where something needed to give and that’s how I got into Getting Ahead. I realized all I’m doing is not in vain, but for a purpose and to keep moving forward and sooner or later a door will open,” Martin said. Martin is currently working on getting a degree in social work and working with the Circles initiative. “I can see a brighter light at the end of the tunnel,” she said. “I’m moving ahead but have some ways to go. It’s continual and ongoing for me but I do see people in my life now that would’ve probably not crossed my path otherwise. They’re pushing me through and making me know that even though there are setbacks I can still move forward. That’s what I needed – relationships and someone telling me ‘yes you can do this’ and not pulling me down,” Martin explained. And make no mistake, Getting Ahead is not just a financial class – it’s a put-your-plan-to-action class. “I originally thought Getting Ahead was like a financial education or budgeting class. In reality it’s way far from a budgeting class, it’s a ‘get your fight’ back kind of a class, know where you’re at in life and move forward, versus just a pen and paper and someone telling you what to do as far as your finances,” Martin said. “More realistic goals are changing the mindset of the community so that people understand what it’s really like to live in poverty, what the systemic barriers are, what people in poverty go through, changing the mindsets of the individuals that are involved and increasing and promoting self-sufficiency,” she continued. So far they’ve seen great results in other communities. “Through building these relationships in other communities it’s shown that people increase their employment, education and income – helping those individuals but also the community,” Scheck said. · Attend a meeting and see what it’s all about! Weekly beginning in January, Circles weekly meetings will be held at Westminster Presbyterian Church on Wednesday evenings from 5:30-7:30pm. All meetings begin with dinner and child care is provided to all who need it – we do structured youth activities to foster growth and development for the children. *First two months (Jan & Feb) will be spent getting to know everyone – this will be when Allies and Circle Leaders get to know one another and start to build relationships before they are matched in the Circles group they will work in for the next 18 months. *1st week of every month – Individual Circles meetings – each Circle (consisting of one Circle Leader and two Allies) will meet in a private area of the church to discuss what is going on in their lives, how to implement the Circle Leaders’ plan to move out of poverty, and provide positive support to one another. *2nd week of every month – Topic – Circle Leaders will choose a topic they want to learn about and we will bring in a speaker to teach them about that topic. Discussion in small groups is also part of this programming. *3rd week of each month – Guiding Coalition – this consists of five teams who support our entire collaborative by focusing on different areas: recruiting volunteers, raising money, planning meetings and educational sessions, or creating job and educational partnerships for the participants in our program. *4th week of each month – Big View – the Circle Leaders will choose a community issue that is a barrier for people in poverty. We will learn about the issue, research ways to address or fix the issue, engage with community leaders and stakeholders to begin discussing the issue, and then carry out a plan for fixing this issue – creating long-term community and systemic change.